The menu display outside Dirt Candy. 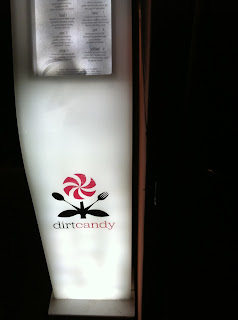 I finally got to go to Dirt Candy recently - it only took a month's wait for a reservation. For 9:30 PM. 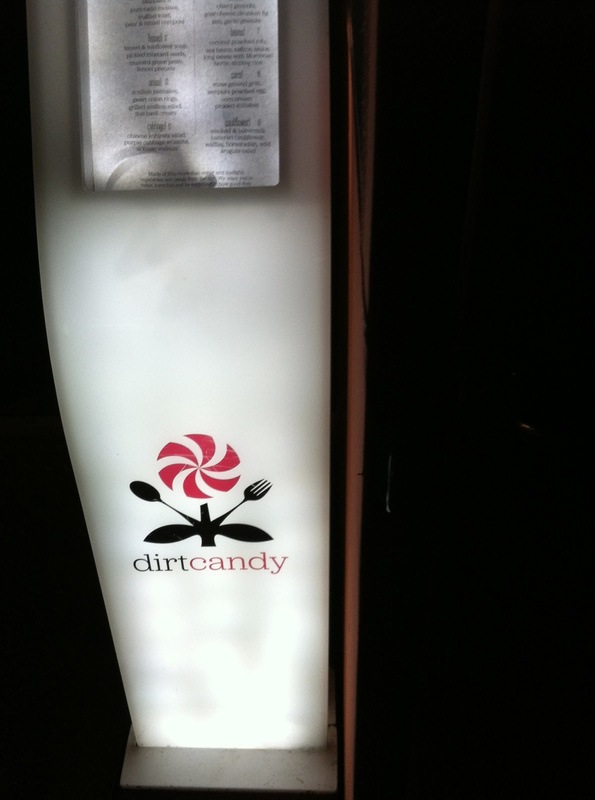 Dirt Candy specializes in vegetables, and its owner/chef Amanda Cohen is something of a celebrity chef - she was even on Iron Chef against Morimoto - although he won. My daughter and her chef partner had been enthusing about this place for months so I thought it would be fun to check it out. It was worth the wait, in spite of the fact that the entree I ordered (corn) was mediocre, because the fennel soup appetizer was amazing. Even by our standards, the Goldmuskateller is a weirdo, but a surprisingly friendly one. It’s got a strong musky smell that oozes out of the glass like a low-lying fog, making you think that a family of gigantic grapes just sat down next to you, but it’s cut with a sharp, crisp apple aroma that reminds you of biting into Autumn’s first apples. Then you take a sip of it and it’s something else entirely. This is a very hot wine, so when you taste it first you get a nice, mellow taste of honey and then you get slapped across the cheek with an astringent pine flavor, almost like you’re drinking nettles soaked in honey. It’s a pretty neat trick: you’re lured in by the smell of apples and musk, you get a taste of honey, and then your tongue gets lashed for being so cheeky. It sounds violent, but to be honest it’s really enjoyable. Rather than a mellow wine lulling you into an alcoholic stupor, the Goldmuskateller is a hot-blooded wine that kicks you awake. Although we had the 2011 instead of the 2007, or 2010 listed on the site but based on this description they are very similar. I've never had a wine like it. I will definitely be tracking this down and buying it. The restaurant blog has other good stuff. This spoof posting for "Man Candy" is pretty great - especially what looks to be the covers of actual manly magazines for men. I especially like the giant otter attack.